Hollywood (October 3, 2018) – Five years ago, IMAX Corporation and Chinese Theatres LLC (www.tclchinesetheatres.com) collaborated to open Hollywood’s first-ever IMAX® theatre, bringing the iconic theatre into the 21st century in a major new capacity and giving Hollywood its first IMAX® theatre, providing film fans with a movie going experience that will rival any in southern California. Home to the world’s biggest, A-list film premieres, over 40 per year, and the celebrated forecourt of movie icons’ handprint and footprints, the historic, world-famous theatre underwent in 2013 its first major makeover in 85 years, featuring IMAX’s state-of-the-art digital laser projection system. As part of its IMAX® five-year celebration, the TCL Chinese Theatre IMAX® is offering some attractive ticket packages, applicable for upcoming showings. See website for more details. $5 IMAX tickets 10/3 only, THE HOUSE WITH A CLOCK IN ITS WALLS (purchase day of on-site), $5 Historic Theatre Tours, $5 Coke/popcorn combo, $5 historic souvenir program highlighting the TCL Chinese Theatre’s 90-year history, and more! 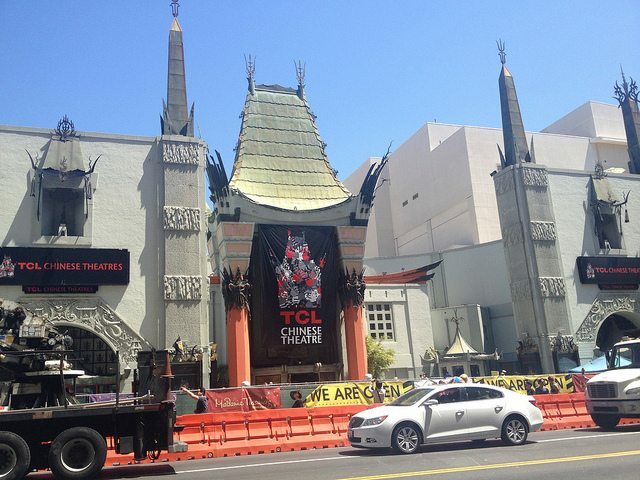 The TCL Chinese Theatre, the iconic movie palace opened in 1927 by Sid Grauman, is celebrating its 90th birthday this year. Best known for movie premieres, red carpet events and handprint/footprint ceremonies, the TCL Chinese Theatre has long been at the center of Hollywood and remains the beloved movie theatre for many Hollywood celebrities.